This month, Britain’s Royal Mail is issuing a collection of stamps to commemorate the centenary of women getting the vote. 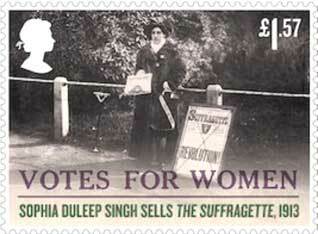 One design features an unusual and unsung participant in the suffragette movement — Princess Sophia Duleep Singh. The daughter of Maharajah Duleep Singh, the last ruler of the Sikh empire, and goddaughter of Queen Victoria, she is pictured in 1913 selling copies of The Suffragette newspaper outside Hampton Court Palace, where she lived with her family in a suite of apartments. Born in 1876, Princess Sophia grew up at Elveden Hall, Suffolk, where her father lived in exile. She was by all accounts a quiet and shy child, hardly a threat to the Establishment. In 1894, she moved to Hampton Court Palace at the invitation of her godmother Queen Victoria and established herself as a socialite. After witnessing poverty and deprivation on a trip to India, Sophia returned to London with fire in her belly -- a radical had been born. She joined the suffragettes in 1909 and led a march to parliament on November 18, 1910, with Emmeline Pankhurst. The day became known as Black Friday, after scores of protesters were beaten and detained by police. Witnessing the brutality only strengthened Sophia’s resolve. On the day of the King’s speech to parliament in 1911, she threw herself in front of the car of the prime minister, Herbert Asquith, while brandishing a poster that read “Give women the vote”. To avoid embarrassment to the Establishment, she was released without charge. As an advocate of the “no taxation without representation” campaign, she was twice summoned to court and fined for non-payment of taxes. Princess Sophia chose to risk her comfortable and privileged life to fight for causes she felt passionate about. She died in 1948 and, as she had wished, her ashes were scattered in Punjab in line with Sikh rites. 1: Pardeep Singh Nagra (Toronto, Ontario, Canada), February 05, 2018, 10:35 AM. 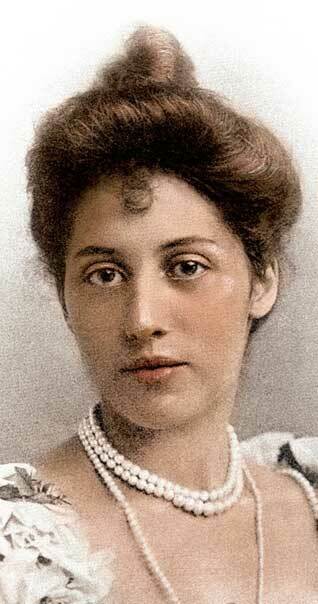 Princess Sophia Duleep Singh showed the world not what a princess should be, but what a Princess could be. A great tribute to a great Suffragette. A legacy all Sikhs should be proud of.